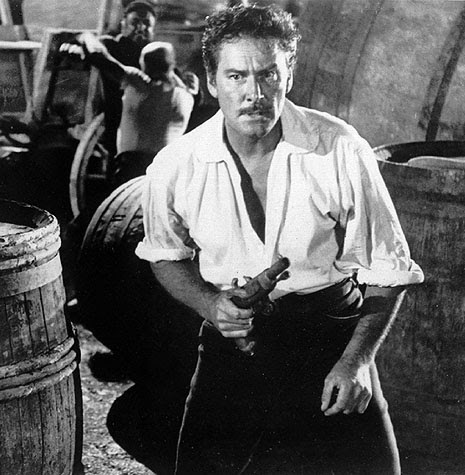 Once again Errol Flynn stars in another film utilizing the Adventure tag in the title harkening back to the days of Robin Hood and Don Juan when he was still associated with the Warner Brothers studio. For this tale of 1860 New Orleans (filmed in France) he’s a long way from the glamourous technicolor productions under Jack Warner’s watch. Instead it’s a sparse black and white affair that Errol gets a screenwriter credit on as well as top billing. 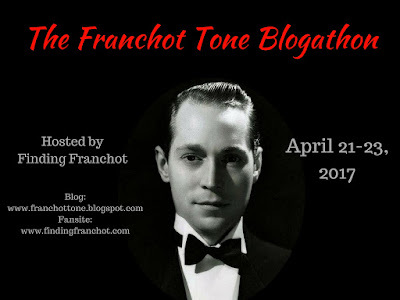 The funny thing is it’s almost as if he’s a secondary character for much of the proceedings that see Vincent Price tangling with leading lady Micheline Presle as the pair wallow in murder and wealth. Price is a well to do nephew of a shipping magnate who is set to marry into the Wintrop family. This doesn’t set well with house maid Miss Presle whom Price is carrying on an affair with behind his fiancé’s back. When Price turns up late at night looking to continue his clandestine affair, she’s carrying on with another man who will end up dead. Price can’t afford a scandal and rather than face the music will point the local police towards Presle who is arrested and about to be fast tracked to the hangman’s noose. With the police and the magistrate in his hip pocket, Price’s good family name is to be left out of the court case. 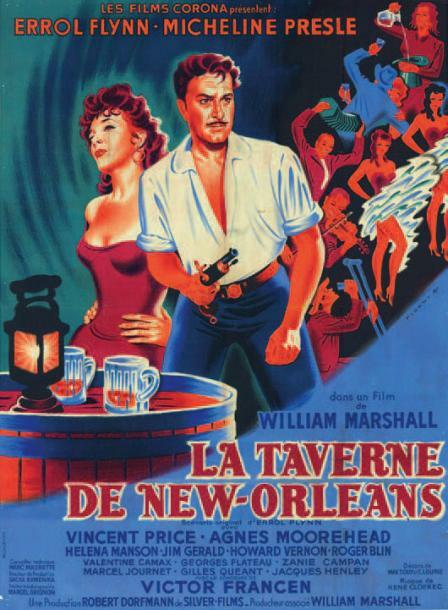 Into New Orleans comes Flynn’s seafaring Captain Fabian. In top hat and fancy duds he’s ready to partake in the local lovelies as one would expect of Flynn until he learns of the scandal involving Presle. 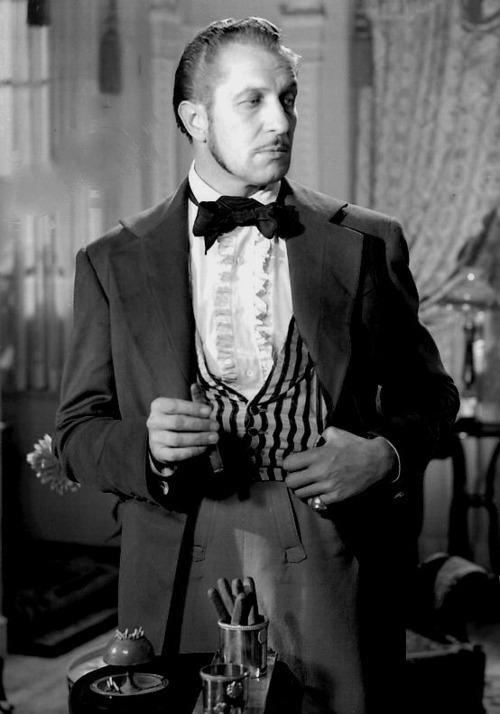 It seems as if he has a past score to settle with Price and his Uncle played by Victor Francen. 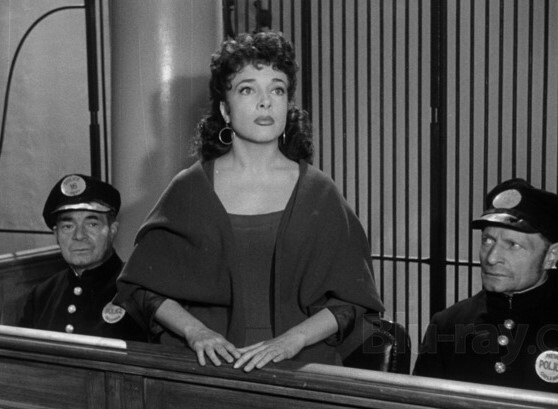 After getting some gossip on the case from Jess Franco favorite, Howard Vernon, Flynn more or less blackmails the court into releasing the girl into his custody and dropping the charges. Also appearing is Agnes Moorehead as Presle’s rough around the edges friend. Agnes and Flynn will get a chance to verbally spar as she flirts with him and while he flirts right back, we know of course that this isn’t going anywhere but it does spark some life into the film that is a poor comparison to Flynn’s earlier on screen triumphs with the ladies. 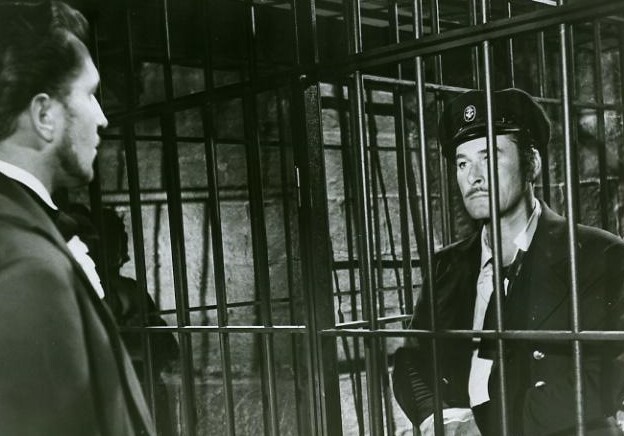 Flynn will all but disappear for another chunk of film as the movie focuses on Presle’s attempt to gain revenge over Price for his conspiring to push her thru death’s door. All in an attempt to preserve his name and standing in the community and of course the riches that will be bestowed upon him when Uncle Victor passes. Yes that might be sooner than you think. The film might have been better served overall sticking to the story of Price and Presle in a gothic setting that Price was so at home in on screen. The pair deserve each other when he kills his Uncle and she schemes and conspires with him to hide the body. Her price? Marriage, wealth and respectability. Price appears to be a beaten man but will turn the tables on her and Flynn who he perceives as her lover. 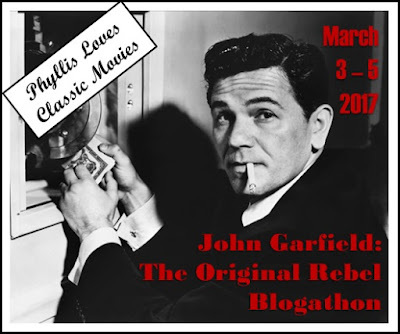 Errol will indeed turn up once again over the final third of the film when the script calls for plenty of fisticuffs and a fight to the death with Price. The scene is played out in hand to hand combat but I couldn’t help wishing they both had picked up a sabre for the closing battle. I won’t bother to tell you who wins though I suspect you can probably guess correctly. When the film does come to a close it doesn’t exactly take a keen eye to realize that Errol is obviously using a stand in as the camera very carefully films his character off center or from the rear in the fadeout. The film was directed by leading lady Presle’s husband and co-producer with Flynn, William Marshall. Apparently he took over the director’s reigns after Robert Florey bowed out though Florey remained as a consultant on set by all accounts. Flynn and Marshall would also team on what is possibly a lost film titled Hello God. If not, please point me in the right direction. Flynn was by this point bouncing between studio films and independent productions that were seemingly challenged when it came to securing budgets. His William Tell being a prime example. Flynn still cuts a heroic figure at this point in his career and putting him opposite Price is a good match. 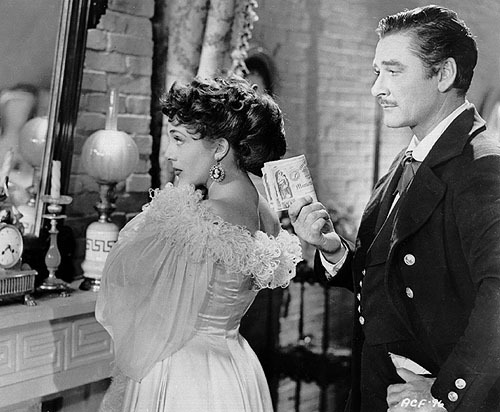 Vincent had previously appeared with Errol in the technicolor extravaganza The Private Lives of Elizabeth and Essex that is today known more for the onset battles between Flynn and Bette Davis. Sadly Price would bring suit against the producers for full payment of his salary which again points to budget issues. 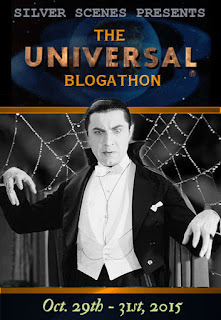 Again this may have been better served as a gothic thriller with Price at the center of the story as opposed to being a costar in the proceedings. 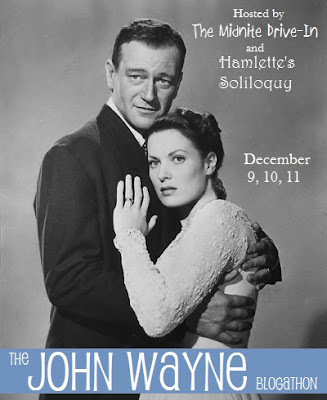 As it is, it’s an opportunity to see two favorite actors from yesteryear share the screen together as they tangle over an old grudge and the leading lady. 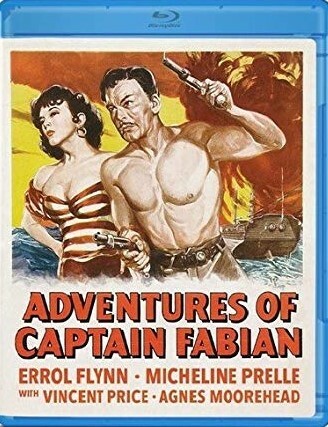 This Errol Flynn adventure is available from Olive Films on DVD and blu ray and if you collect both Errol and Vincent films then it’s rather obvious you’ll need a copy even if the film doesn’t place in their top ten cinematic outings. I kind of liked the film in spite of its drawbacks. You highlight those well here – it does seem undecided what type of film it wants to be and where its focus should lie but the stars are very enjoyable – as they always were – and you’re quite right that watching them on screen is a pleasure in itself. This is a case of my seeing it as a kid and thinking nothing of it other than it’s the guy from Robin Hood and the other guy with the scary voice. Then when you start to study movie history it becomes a bad seed because of negativity surrounding the project and final outcome. 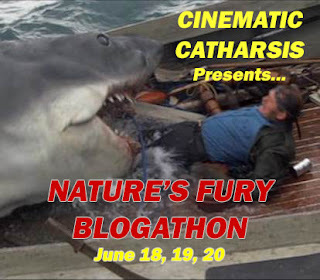 I always look for the positives and sure it’s no Captain Blood but again, isn’t nice to sit back ad watch two of our favorites tangle on screen. B Movie-just click on Lesley Selander and you will find it. Nice piece on Republic Pics and like the dialogue selection. Mis-Information. lol. Nice trivia bit there on Warren. Price stories of his off screen interests never fail to both astonish and interest me. Yes,and it’s good to know even as far back as 1942 Vincent was supportive of young up and coming artists. Thank you so much for taking the time to read my Republic piece.